While we often associate beets with warming, hearty winter recipes, this root veggie is also delicious in the spring and summer. In fact, beets prepared in a flavourful marinade served over salad greens is one of the tastiest ways to eat them. This recipe is uplifting and refreshing with zesty lemon juice and a subtle bite from fresh garlic. Beets are rich in the phytonutrients called betalains (gives them their beautiful color), which have been studied for their antioxidant properties as well as for their role in supporting the liver’s ability to detox toxins from the body. If you eat dairy, you could add some goat or sheep cheese crumbled over top of this salad. You could also add in some other vegetables, such as cucumber and radishes, if you want more variety. 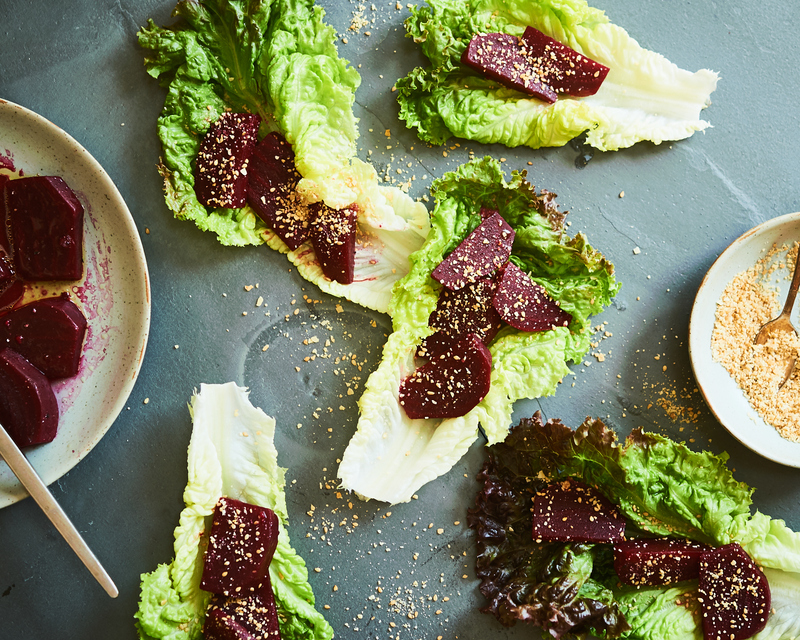 But, the crunch of the toasted sesame seeds and almonds pairs perfectly with the tender beets. 1. Peel the beets and cut into small wedges. 2. Place the beets in a small pot with around 1/4 cup of water (enough water to cover the bottom of the pot and some of the beets, but they don’t need to be completely covered). 3. Bring to a boil and then reduce to a simmer. Cover and simmer on low heat for 15 minutes, or until the beets are tender. 4. Run the beets under cold water to cool them down. 6. While the beets are cooking- rinse off the lettuce well and make sure to dry. Pull the leaves apart carefully, leaving them whole (remove any wilted or dirty parts). 7. Place the leaves out on a serving platter and serve some beets into the center of each leaf. 8. Place the sliced almonds and sesame seeds on a baking sheet and toast lightly at 350 in the oven for 5-7 minutes, until just light golden (be careful not to burn). 9. Once toasted, pulse the almonds and sesame seeds in the food processor into a crumble. 10. Sprinkle the crumble over top of the beets right before serving.